An Israeli attack on a UN school has killed at least 19 people who were seeking shelter from the ongoing military assault. This latest attack has raised the Gaza death toll to almost 1,300 people. And according to Gaza Health Ministry, more than 7,100 people have been injured. Now joining us is Omar Barghouti. Omar is an independent Palestinian human rights activist and the cofounding member of the group BDS–boycott, divestment, sanctions movement. Thanks for joining us, Omar. 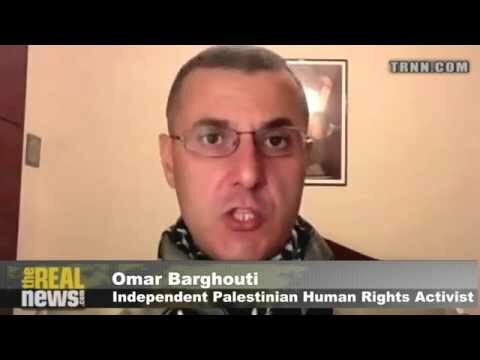 OMAR BARGHOUTI, INDEPENDENT PALESTINIAN HUMAN RIGHTS ACTIVIST: Thank you. DESVARIEUX: So, Omar, the UNRWA commissioner–I just read his quote–he said that this school’s location had actually been communicated to the Israeli army 17 times. What do you make of the UN’s condemnation of the attack? BARGHOUTI: It’s too little too late. Because of the UN’s silence in the past two attacks on UN schools, which were designated as humanitarian shelters and whose coordinates were provided to the Israeli military, their silence before is what led the Israeli [military] to carry on with their massacres against Palestinian civilians. Especially children and women are sheltering in UN schools. So they have Palestinian blood on their hands, the entire UN system, especially the secretary-general, Ban Ki-moon. His statements in the past after Israeli massacres and attacks on UN schools were scandalous, were absolutely shameful. And they take part of the responsibility for cheering Israel on to carry out this ongoing massacre. DESVARIEUX: Omar, I’m going to take up sort of the UN’s side and ask you–if they were here, I’m sure they would defend themselves and say that we really didn’t know where these attacks were coming from. There were sort of conflicting reports, some saying that it was Hamas’s rockets, some saying that it was Israeli bombs. What would you make of that argument? BARGHOUTI: The UN itself has investigated all the attacks. In all of them, the UN has found that Israel was the one that attacked those schools, those UN-designated humanitarian shelters, despite having the full coordinates and despite having the top technology and the top precision guidance systems. Israel does not make mistakes in their attacks. They know what they’re attacking, and they’re doing it deliberately. This was one of the conclusions of the Goldstone Report in the 2008-2009 Israeli assault on Gaza. They said Israel acted with precision, and therefore it had an intention to terrorize the civilian population. In fact, Israel’s military follows a doctrine called the Dahiya doctrine, which refers to the southern suburb of Beirut. This Dahiya doctrine, developed at Tel Aviv University, calls for disproportionate force against civilians and civilian infrastructure to extract the maximum pain from those civilians, to make them stop the resistance–an absolute collective punishment crime against humanity. DESVARIEUX: When you hear of the bombing of schools and shelters, you can’t help but wonder: is this giving more fuel to the boycott, divestment, sanctions movement that you’re a part of? Can you just give us an update? BARGHOUTI: Sure. It’s extremely painful for us as Palestinians to see our children, our women, young men, elderly, people with disabilities being just murdered in the dozens and hundreds and hundreds by ongoing Israeli assaults, by U.S. weaponry for the most part. But, yes, we have promised our brothers and sisters in Gaza that we in the BDS movement will make Israel pay a very steep price this time around. Israel will pay a very heavy price through increased isolation around the world. We’re already seeing a lot of positive signs in that respect. Just yesterday, The Hollywood Reporter reported that major Spanish actors and filmmakers, including Penelope Cruz, Javier Bardem, and Pedro Almodóvar, all Oscar winners, signed a statement condemning Israel’s acts in Gaza as “genocide”, calling on the E.U. to take measures to stop Israel’s genocide in Gaza. A-list artists like Madonna, Rihanna, and many, many, many others have come out and expressed solidarity with Palestinians. #FreePalestine hashtags were sent off on Twitter and so on and so forth. This is absolutely unprecedented. We have never seen such celebrities, such [Hollywood (?)] figures and top entertainers express any form of solidarity with Palestinians, let alone criticism of Israel. So this is happening. At the same time, University of California Student-Workers Union has just adopted BDS. And they’re calling for a full referendum among the student body next year at the University of California to endorse BDS– boycott and divestment–against companies involved in the occupation and violations of human rights. COSATU, the South African trade unions federation, has called on workers to stop handling Israeli goods, to stop loading and offloading Israeli ships. This is extremely significant for the Palestinian BDS movement. There are so many actions going on around the world that are increasing Israel’s isolation. Contracts with Israeli companies are being canceled. Israel is feeling that it’s facing a lot of pressure on its goods and services around the world. Major basketball players have canceled their involvement with visits to Israel in September, including Magic Johnson and others. So a lot has been happening, and Israel is feeling the pinch. But this is only the tip of the iceberg. We promise every fallen person in Gaza, every wounded person in Gaza, that Israel will pay a very heavy price through the BDS movement. DESVARIEUX: Alright. Omar Barghouti, thank you very much for joining us.